Jalgaon, 3 May 2017: Last month, Jain Irrigation hosted a group of WBCSD member companies for a two-day visit of company’s facilities in Jalgaon, in Maharashtra, one of India’s leading states in terms of agricultural production. The visit brought together representatives from seven companies, part of the WBCSD Water-Smart Agriculture working group, to generate learnings and discussion around collaboration opportunities for companies to address water scarcity in agricultural settings. The visit demonstrated water-smart agricultural solutions in a drought-prone area and strengthened WBCSD member companies’ resolve to join forces with Jain Irrigation and work towards furthering the implementation of water smart solutions in agriculture. As the work of the Water-Smart Agriculture working group in India has revealed, when applied in the appropriate context and with robust management, investments in water-efficiency deliver significant co-benefits for farmers, and for businesses dependent on farms. As water scarcity increases, business operations are impacted due to high water-use in agriculture. The impacts of water stress in India were evident in early 2016 when 300 million people in the country were found facing severe water shortages following two consecutive years of weak monsoons. Farm production came down and industrial production was significantly hit. The aim of the WBCSD Water-Smart Agriculture working group in India is to scale-up and co-implement water-efficient technologies, practices and solutions in India delivering value to both businesses and farming communities. It forms integral part of the WBCSD Water Cluster and Climate Smart Agriculture projects globally. Jain Irrigation are a WBCSD member company taking an active role in WBCSD’s Water-Smart Agriculture working group. Head-quartered in India with a global presence, Jain Irrigation have developed an array of solutions in food, water and land-use as well as in renewable energy. A visit to the Jain-farms helped WBCSD-members experience the implementation of Jain G.A.P standards. In line with the Global G.A.P, these are entry-level standards and certification system developed for onion, bananas and mangoes, helping small and marginal farmers attain the best possible yields for these crops and dealing with the buyer’s concerns for food safety and traceability. The members appreciated the Minimum Support Pricing instrument implemented by Jain Irrigation on a contracted-base of 6,000 farmers. The mechanism ensures the company's onion-drying and food-processing facilities have a reliable supply, while assuring farmers get a fair return, often better than the prevailing market prices of these products. Anil Jain, Vice Chairman and CEO of Jain Irrigation said in his address to the group, “Quality is a way of life at Jain Irrigation. Our biggest strength is our presence with farmers through our field extension teams, so we serve as a living laboratory to develop solutions to respond to the challenges they face, and constantly fine tune them as we go. Our solutions are affordable, yet deliver specific and measurable impacts. I’m proud to say that the shared value realized today is a result of our hard work and the trust we have developed with farming communities over many years”. Jain Irrigation’s establishment in Jalgaon hosts a Tissue Culture Research and Production facility, and boast the largest certified laboratory on banana, pomegranate and strawberry cultures in the world. The learnings from this visit will help the WBCSD Water-Smart Agriculture working group advance on its action plan to implement and highlight scalable solutions to address water scarcity in agriculture. It also allows to build on the findings from the forthcoming paper “Co-optimizing solutions in water and agriculture: Lessons from India for Water Security” (August 2017). 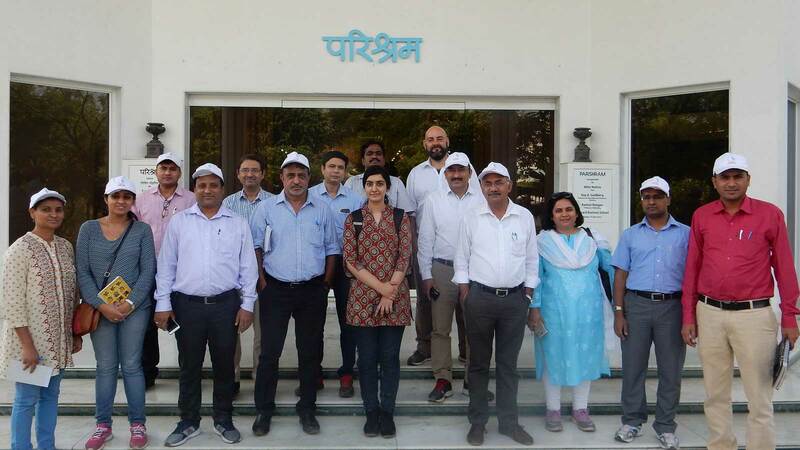 The Water-Smart Agriculture work forms part of the WBCSD Water Leadership Group in India, an alliance of 10 member companies taking leadership on water and business issues in India.